For the avid skier, nothing beats a solid, quality pair of cross country skis. But with hundreds of different types of skis on the market, it is important to know what aspects to consider when evaluating the purchase of any given pair of skis. Quality, cost and target skill level are all crucial when selecting the appropriate set of skis and failing to consider these aspects along with any individual preferences will result in an unhappy investment for the skier. While investigating various skis, we were lucky enough to come across the Black Diamond Kilowatt Skis: a solid set of skis at a newly discounted price. The Kilowatt Skis are a high-end ski set developed by Black Diamond, a winter sports company that has specialized in climbing, hiking and skiing equipment since 1957. The very reasonable price tag of $350 attached to a Black Diamond product was enough to make us stop and stare as most of their skis cost at least twice as much and are certainly worth it. Due to these circumstances, a review of the skis is in order to determine more about how well the Kilowatt Skis hold up to other competitors and who specifically would benefit from purchasing these skis. One of the most noticeable aspects of the Black Diamond Kilowatt Skis is the flexibility of the ski that is present all the way to the tail; the tail is slightly more rigid but one would expect this. The wood core gives the skis a feeling of dampness that has been lacking in more recent skis, which provides an even smoother ride. The predictability and stability of these cross country skis in powder is definitely reassuring and the ease of turning makes them ideal for beginners who need that forgiveness. There are a couple of downsides to the Black Diamond Kilowatt Skis, also. Later on, it was discovered that the reason the price on these has dropped is because this is the 2007 Kilowatt model. While age does not necessarily mean the skis are no good, it is a fact that there have been newer releases since that have gone through a few additional years of fine-tuning while these cross country skis have not. It is also advised to stay away from hard snow on these as the edges are not designed to take advantage of these conditions. 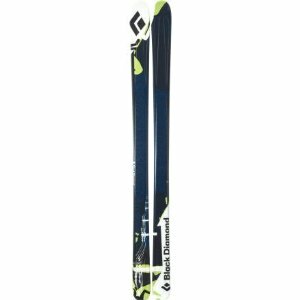 For beginners and intermediates, the Black Diamond Kilowatt set will make a great set of skis and is far more affordable than most other high-quality products. Think of it as buying a five-year old Mercedes that has never been driven for less than half its original price. When it comes to a great pair of cross country skis that do well on groomed surfaces and powder alike, the Kilowatt series from Black Diamond is worth every cent and more. This entry was posted in Black Diamond, Reviews, Skiing, Skis and tagged Black Diamond, Skis. Bookmark the permalink.